Confession time… I’m totally a notebook-a-holic, paper planner aficionado, and workbook addict. My mom has pictures of me carrying a bag full of mini diaries, post it note packs, and ruled notebooks when I was just a toddler. I wouldn’t let anyone throw out or touch my paper products, and when we moved into our house my mom mailed me all of my paper addiction “collection”. My paper planner addiction took on a more “serious” role when I became an entrepreneur, because I had a reason to use all of these awesome productivity tools I kept finding. And I’m always open to trying a new type of notebook, too. My husband has to steer me away from the paper aisles at Target, and I avoid shopping when it’s “back to school” time because I will end up bringing home more paper products than I can use. Over the years, I’ve tried a ton of different entrepreneurial paper planners, so with the new year around the corner I thought I’d do a full on review. Now I need to say that none of these are products that you absolutely NEED to have. That might sound weird, but from my personal experience it’s not so much about which notebook or planner you use… As much as actually using it on a daily basis to get stuff done that really matters. 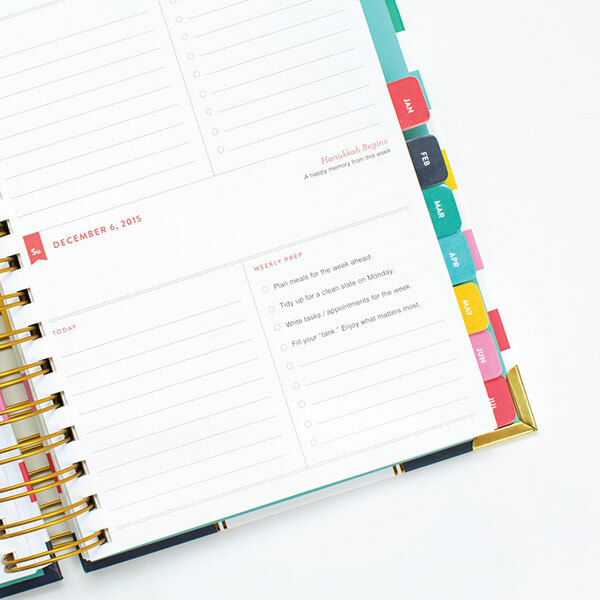 So please take this side by side planner comparison as a fun way to pick a helpful tool for your year… And not as a “silver bullet” that will change your life. Yes, if you pick one of these and you end up putting it to good use you will most definitely have a productive year and get a ton of amazing traction in your business. But that will be because YOU made it happen. You just happened to have a cool and motivating sidekick notebook to make it easier. Some of the links in this post are affiliate links, which means I may earn a small commission for recommending them, but I would be sharing this review with you regardless of the affiliate links. So with that caveat out of the way, let’s take a look at these pretty planners, shall we? A few years back my friend Briana held a successful kick starter campaign to produce her Rituals For Living Dreambook, and I think it’s just gorgeous. This is a combination life planner for the big things you want to accomplish in the next 1, 5, and 10 years… and a system for breaking it down into smaller chunks that you can take action on week after week. I like how there’s an emphasis on doing something fun for yourself each week, giving gratitude for the amazingness in your life, and also picking only 3 top priorities per week. The size of the planner is also great, small enough to carry with you, but it carries enough gravitas to make you heed your dreams. Who it’s for: This dream book is most definitely ideal for entrepreneurs, and while it’s not a daily planner it will give you clarity on a weekly basis to move toward your goals. Oh, and there is a daily planner option / addon you can check out, too! I finally got to play with the Daily Greatness planner, and it’s been an amazing way to think through business decisions and think big. What I like about it is that it’s an un-dated yearly planner, so you can start using it anytime (no need to wait for the new year!). It also includes finance and budget worksheets, quarterly goal setting pages. Plus there are specific prompts for daily, weekly and quarterly planning. If you like to plan on paper, there’s a social media content planner section, the one-page business plan to keep you focused, and on-going check ins to keep you motivated throughout the year. They also offer non-business planners for your overall life goals, I have a feeling it’ll be the perfect fit for those looking for a colorful planning tool! Who it’s for: The Daily Greatness company offers different journals and workbooks based on your needs, but I’m especially keen on the Business Planner for entrepreneurs. The books are colorful and flexible enough so you can be your own guru! There’s something to be said about zigging when everyone is zagging, and Danielle LaPorte’s Desire Map Planner does just that. Instead of focusing only on your productivity and getting your “todo items done” each day, the Desire Map Planner has you looking at how you want to feel first. Once you’ve gotten into the feelings that really light you up, you can take action in more aligned and soulful ways. This is awesome because as a Type A go-getter like many of us entrepreneurial ladies are, it’s nice to take a step back and remember why we’re doing all of this in the first place. What I love about these planners is the beautiful cover designs, and the intentionality behind the method. There’s also a daily, weekly, and monthly spread which is awesome for keeping track of all your activities. Who it’s for: Danielle designed this for entrepreneurs, but I think it suits anyone who wants to lean into their core desired feelings on a daily or weekly basis. It’s great if you’re ready for something a little different. In 2017 I released my own paper planner for creative entrepreneurs with lots of ideas. This isn’t a weekly or yearly planner, rather it’s an idea planner. The Idea Sanctuary™ Ideabook is a paper planner that focuses on bringing your best ideas to market, by helping you plan and take action. It helps you brainstorm, refine, and market your business ideas successfully. It’s the exact process that I use to launch successful programs and ideas on a regular basis (having earned millions of dollars in my business with this process), including how to mind-map an idea, schedule a marketing campaign, and even write a sales page. It’s 200 pages of idea-refining exercises, prompts, and step-by-step guidance to capture your best ideas and make them happen. Who it’s for: This ideabook is for creative entrepreneurs who have a lot of ideas, and who need that safe space to explore them further and make them happen. It’s perfect if you’re just getting started in business, or for your next big breakthrough idea or project. This isn’t a weekly planner that you can just purchase, because you need to be a client of the Strategic Coach program (which is a yearly mastermind-style program that runs just under 5 figures per year)… But I wanted to include it here because I like to joke that it’s my most expensive paper planner. One of the things I really like about this planner is that you start a new one every quarter, and there’s a big emphasis on celebrating your successes along the way. There are also places to track the different tools that are specific to Strategic Coach, like splitting your days between Focus, Buffer, and Free Days. Who it’s for: This weekly planner is only for Strategic Coach clients, but you can draw inspiration from their Positive Focus page and make reviewing your successes a habit. I really like that it condenses all the practices of the program into doable daily habits! I first started using my Day Designer back in 2013 when Whitney English was a sponsor for our Off The Charts event. I fell in love with the impeccable design, the focus on the entrepreneur’s busy day… and the gorgeous daily quotes. This daily planner is a beast because it includes one page per day, but this is great because it allows you to write down daily meetings right beside your daily to-do’s. This was the first planner to offer such a simple and effective design, and it’s still a winner today. One drawback for myself personally is that I prefer to organize my meetings and calls via Google Calendar, and keep my paper planner for my own todo items. Overall, I absolutely loved using this day designer and it definitely kept me on task and productive! Who it’s for: Designed for busy creative entrepreneurs, it blends productivity and design beautifully… It’s one of those planners that you won’t want to get rid of, but it is pretty bulky so you won’t be carrying it around with you a lot if you travel often. The next contender is very much on the same plane as the Day Designer, and it’s equally beautiful and practical. The Emily Ley Simplified Planner has a touch of whimsy and it’s won a couple of awards for design in the printed products industry. I got whisked into the excitement last year because I couldn’t decide on which cover design I preferred (all so pretty!). I ended up not using the planner as much as I anticipated, despite the fact that it’s gorgeous, because of the small space for writing out tasks. Just like the Day Designer, there’s a page per day which makes this a bulkier planner and you need to squeeze your meetings and calls beside your daily tasks. The quotes and calendar are a nice perk, and it’s expertly designed and I hear this year the planners are a little lighter and more portable, too. Who it’s for: From my understanding, this planner is more geared toward moms and busy ladies of any kind. It’s less entrepreneur focused, and it includes a spot to mark down what you’re making for dinner, too. These planners are gorgeous and very colorful! This planner is good for the commitment-probes among us, because one planner only represents one month at a time. That means that you’re not tied to a planner for an entire year, which might suit you if you want to play the planner field a little. This also makes this planner one of the more expensive options, since you’ll need to get 12 of them to cover your whole year. That being said, this action planner has a few features that make it stand out. One of the things I love about it is the emphasis on writing down tasks for the week – and who you are delegating them to. This helps you offload or at least start to see how you can stop being the bottleneck in your business. The other cool feature is the “outgoing ships” section, which is all about doing one small daily action that might bring back a cool opportunity. My only complaint with this planner is that there isn’t a ton of space again to write down tasks, since it is a smaller planner and it tries to fit a ton of different types of things on each page. Who it’s for: This paper planner is most definitely designed for entrepreneurs, and you can tell that it suits the creator’s workflow to a T. I recommend giving it a try if you’re looking to fine tune your daily planning and try something different. This is one paper planner that I have yet to try, but have heard great things about. This one is ideal for you if you like having a weekly at-a-glance view of your calendar. Personally, it reminds me of the types of agendas and planners that we had in our primary school years… and it doesn’t provide enough space to enter my daily tasks. But I can see how it would be really beneficial for planning lots of different weekly events, so if your business has more of that type of flow (and you’re not on the Google Calendar train) then this might be a good option for you. Who it’s for: I can see this planner being a life saver if you travel a lot and need to keep track of different appointments, important dates for launches, and really looking at things from an at-a-glance viewpoint. It could even make a great editorial calendar! The Passion Planner is another kick starter success story, and I love the ethos behind the brand. It’s aimed at a more mainstream audience who are ready to embrace their passions and make a change to their daily lives. The design shows a full week of days over two pages, which is a nice compromise from the full-on (and heavy!) daily planners out there… This gives you just enough space to write down all the meetings and calls you might have, with another section for your todo items in more detail below. I do like how tasks can be broken down into personal and work, and how there’s a “top priority” and “errands” category, too. Overall, I think it’s a fun and very usable planner with cute quotes and lots of function packed in. It doesn’t have the same design flair as some of the others, but it might just spark your passion! Who it’s for: Ideal for anyone who wants to break down their bigger yearly or monthly goals into doable weekly action plans. It’s got a younger vibe and the founders are really passionate about what they’ve created. This is a new planner that I discovered just last year, and they have both a dated version or an undated 6-month “start any time” version. There are a few things that really made me enjoy using this weekly planner: it offers a monthly “30 day challenge” which is great for changing habits or going after bigger goals. It’s also got useful journaling prompts, and nudges you to review your monthly and yearly goals each week. Plus, it has a great “2 in one” system where the first half of the notebook is your weekly planner and the second half is reserved for notes. I usually have two notebooks going at a time, and with the Volt Planner I’ve been able to reduce it down to just one. The only downside in my opinion is that it’s a no-frills black notebook, which isn’t as pretty or colorful as some of the other ones on this list. Who it’s for: This planner is awesome for more corporate ladies who want some introspection along with their high-power goal achieving. I also think it’s perfect for you if you travel a lot, since you can have all of your important tasks and notes in one place. 12. Blank Notebooks – Make Your Own! Okay, now that we’ve looked at a ton of different options for planners and workbooks… let’s be honest here: if you’re reading this, you’re a highly creative entrepreneur and you might be hankering to make your own! From some of my comments above, you might have guessed that I sometimes feel stifled by boxes that are too small for my tasks or that don’t necessarily focus on the things I want to focus on. That’s where picking a pretty blank notebook comes in! Although a blank or lined notebook won’t have a calendar or other cool prompts, it does tend to bend to whatever planning system you prefer. If you don’t quite know how to organize your tasks or todos, I recommend taking a look at the Bullet Journal. Some of my favorite blank notebooks are spiral bound, so it’s super easy to keep my “today” page open and make notes about future days or review past weeks, too. 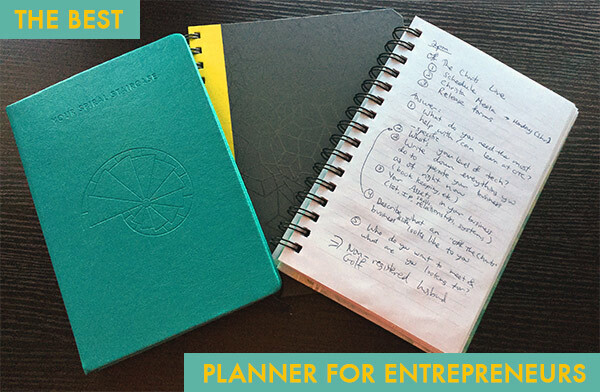 So what’s The Best Planner for Entrepreneurs? You Decide! There’s no one-size-fits all when it comes to choosing the best planner for entrepreneurs, but I think each of these is a strong contender. 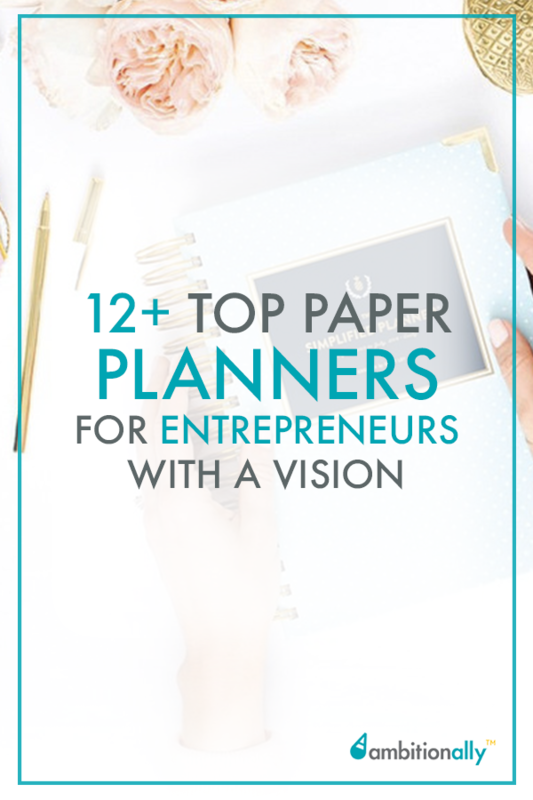 Now that I’ve shared my take on some of the top entrepreneurial paper planners out there, I want to know what you think! What’s your favorite notebook, planner, or organization system? Wow, Nathalie, you really do use a lot of different notebooks! Great round-up. I’ve ordered Leonie’s one on the recommendation of a friend. I have seen a couple of other ones which are tempting, too. I travel a lot, so it’s a toss-up for me between the soothing feeling of using a pen and a beautiful journal, and not having to lug yet another thing around. I’ve not used a planner like this for business before, so it will be interesting to see what (if any) difference it makes. Here’s hoping! I travel a lot too, and I tend to always have some sort of paper notebook with me because I find that I can think better when I’m “offline” during my travels. Plus you don’t need to worry about recharging things. But I totally hear you on the bigger planners and not adding more weight to your purse or suitcase for no reason. It’s a fine balance! Oh, and you’re going to love Leonie’s notebook! I enjoyed reading about the different options! I love your attitude, and I felt like I was reading about myself when you descibed how you collect paper products and such! My daughter and I are the same way, we can drop everything just to spend hours in the writers aisle!! I just never thought of it the way you mentioned, I still have journals from years ago that I can’t seem to get rid of! I am planning in becoming a health coach via IIN this next year and I can’t wait to indulge in these divine pieces of art! Confession! I have 5 on this list. Eeek! And uber confession: I haven’t been able to commit to one longer than a week. So I think make my own planner might be the best best for a rebel planner like me. Or I need to put my girl boss pants on and be more consistent and organized. Thanks for sharing this list. I just got my dream book + dream planner from Briana, and it’s beautiful. I absolutely love using a paper planner and have yet to decide which one to buy – these are all great options! I also have a business planning template that can be used annually to plan out the big picture of your business. It’s free (with opt-in), and could be a great supplement to some of these options too! Great article! I’m always on the lookout for a new planner. As a leftie, it’s integral my planner doesn’t have a spiral which means that I don’t get to enjoy many of the current (beautiful) options. As a(nother) Canadian, it can also be cost-prohibitive to ship here. All that to say that the best planner I’ve found is an old Blueline appointment book. I plot out my fixed appointments on one side and give myself two additional sections for Top Must Dos and Braindump on the other. The opposing page is a great place for meeting/client notes and ideas. It works great…that is, until a prettier non-spiral option comes to town. 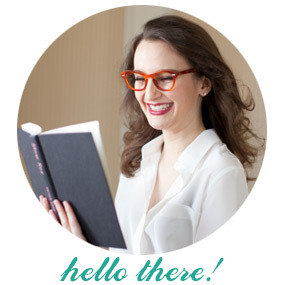 Hi Natalie … I love planners too! I’ve ordered Leonie Dawson’s planner for the past several years and love using it to start dreaming about the year ahead. This year I also supported Briana Borten’s campaign and got the Rituals for Living dreambook and planner. It’s gorgeous and I can’t wait to dive into it as well. Nice to know there are others with “planner” addiction too! Sharon, I looked at your website and the description of your planner is intriguing but I’m very particular about the layout of the actual pages and you don’t show it. Is it possible to see the daily or weekly layout? Oh, I’m loving Inkwell Press. I have an a5 binder and use their inserts. So pretty! And I LOVE the weekly planner tablet. I can just take a page with me on the go. Thanks for this post, I am a planner addict too:) Just this yr! Great roundup! I have used Leonie’s workbooks for a few years, and I find them a fun exercise to do at the start of each year to get the creative juices flowing, but the Passion Planner has really rocked my 2015 and keeps me on track on a weekly basis. I can’t wait for my 2016 Passion Planner to arrive! I also really love the “Give One, Get One” philosophy that the founder has created. I don’t really get the feeling that it is for a younger crowd, but maybe I’m just a really youthful 46 year old. :) Thanks for the post. Used a Franklin Planner since 1980, but jumped ship for next year. I went with PlannerPad. It uses a two page per week format with a funnel down design. I’ve been eyeing the Planner Pad and fear that I won’t use the middle section as much. How are you liking it? I want to get the writer’s journal, but there are no photos of the inside pages to show me what it is like. Can those be seen anywhere online? I did not find them on your site. This was great and in perfect timing since I just discovered this whole planner world!! Im so overwhelmed with the choices I want them all! Thank you for doing this article I felt better seeing the ones on your list also the top ones on my list! There’s another one you should check out the Inkwellpress.com is hugely popular and sold out! even the inserts! Check it out and thank you! Natalie! What great information you have here! I already bought Leonie’s and I can’t wait to go through it (my first year buying print, last year I bought digital). I was really impressed with the Rituals for Life Dreambook and I loved their video on how they come to creating the Dreambook. Thank you for putting this together Nathalie! I think I am going to put together my own notebook because there are so many elements that I love to mix and match. I will keep you updated! This year, I used a planned that I created http://therisecollective.org/how-to-shape-and-design-the-best-year-ever/ and I’ll be updating it this year, and spiral binding it! It really helps keep me on track on a monthly basis. I also put post-its of my goals on my wall in my studio every month in categories: On deck, In progress, and Complete. Then each goal goes under one of these categories. It is so satisfying at the end of the month to see them all in the “Complete” section! I love your blog and emails, thanks so much! I got Leonnie’s on your recommendation last year, and, while I’m sure I underutilized it, I found it awesome and helpful and I’m excitedly checking my mailbox for my 2016 package! I mainly do my planning and strategizing in Evernote and Trello, but I will probably get Leonie’s planner again and maybe also Danielle’s. They are both awesome! Yes, I am a Cancer, but my rising sign and moon are in Virgo. LOVE organizers, planning, checking off lists, and goal setting! This year I used a planner I got at the dollar store since, in previous years, I was unable to commit to a whole year of writing my “to-dos”. I used most weeks in the planner and like to focus on the week ahead rather than daily tasks (they bore or overwhelm me). That being said, I reall really want Danielle Laporte’s new weekly planner!! I have been following her for quite some time and I absolutely love her brain!! She’s so connected and feeling driven and I can’t get enough! What I’m most grateful for, proud about, and overall blown away about for me this year was beating my yearly income goal by September! It made for a pivotal moment in my life and truly can’t wait to see what 2016 has for me! Thanks for your work Nathalie!! I am a Virgo too and suffer from compulsive notebook and book buying, but I am ok with that! I would rather have a book in hand than jewelry. As I sit in my office, I spy 7 different notebooks scattered on my desk. Currently I am using a slightly larger format 8.5×12, that I find more visually comprehensible for me. Also I can’t wait to start using number 6 on your list -Emily Ley’s Simplified Planner in Golden Pineapple! I have already started filling up my 2016! As for my proudest moment of 2015 it definitely is launching my WE Nation Podcast! It is a lot of fun and I love meeting and learning from amazing Women Entrepreneurs! But it is also takes a lot of time and work as you may know, that I didn’t anticipated. That’s where my planning skills and Emily Ley’s Simplified Planner are going to get tested in 2016! Hi Nathalie! I was just starting to shop for a new planner so I appreciate this review. I used a planner called “the inner guide” last year and loved it. It has a section for each month where you list your personal and professional goals as well as priorities for the month. It’s a weekly planner and has a section to list your goals for each week along with an area for tasks and errands. It’s a great way to break down your monthly goals into weekly goals. It also has a section for reflections, ideas and self assesment weekly and at the end of each month. I am not a Virgo but a Pisces and still love planners and planning. Thanks for this great selection of planners. I have not really found THE planner yet. I had Leonie’s for last year and while I find it fun and inspiring and wonderful for reflecting and dreaming, I was not able to stick with it the whole year. After trying a lot of other planners I got back to making my own. I also took the “Zero Procrastination” Course by Karen Kingston which teaches us a top-down approach for planning, top-down in the sense of what is our calling and plan the day accordingly. Yes, what is it with Pisces and planners? I love that about the Passion Planner too! What’s your favorite pen for them. I’ve been using steadtler triplus fineliner pens – they are incredibly comfortable in my hands but challenging to find locally. For years I purchased planners and I was never able to actually use it, leaving me feeling guilty and chaotic. Only recently I came across the term bullet journaling. (Lived under a rock?) And it is changing my life and the way I look at planning. Last year I purchased Leonies planner for the first time in pdf and it is awesome to plan your goals. For 2016 I will use my google calendar for appointments, my paper bullet journal for todo’s and Leonie Dawson’s planner for goal setting. I use the exact same three things as you Marieke. So excited to have recently discovered bullet journalling – no restrictions and I can incorporate my love of doodling and hand lettering too. Have you seen the Get to Work Book planner by Elise Blaha Cripe? She is really action oriented and the planner reflects that. I love planners and paper and office supplies. I’ve tried online and offline. I’ve finally settled on google calender because it syncs with my phone (I just wish I could name the colors with the appointment type) and in January I found the bullet journals. I use the moleskin with the graph paper. I love that it works for my todo lists and notes and other stuff! It’s the only one I’ve used in the last few years for this length of time. The size is perfect to have open on my desk or to carry with me. I’m a massive advocate of the Bullet Journal system. Grab a Moleskine notebook, or your notebook of choice, and make your notes, to-dos, plans totally bespoke for you. I colour code my days for work and personal to-dos and appointments, keep track of my morning routine and adjust as I go.Each evening before I got to bed I write down the priorities/must-dos for tomorrow and set my intentions. Wish I always kept them! As for what I’m most proud of in 2015 – it’s having the guts to quit my job and start my own business, as a single parent I thought I shouldn’t/couldn’t do it, but I’m doing it. Here’s to a success (and well-planned!) 2016! Thanks! It’s helpful to hear about your experiences with Bullet Journal. It’s hard with so many choices, but I agree it can be good to create one’s own, as a creative person! I love pretty planners and I always get so excited by the potential and the prompts. I frequently think I want something beautiful and super feminine and fun. So I buy something like that almost every year. And. Never. Use. It. Then I buy the Action Day planner http://www.actionday.com and write in it all year long. I love that I can see a week at a time and think of my tasks and projects from a weekly perspective. The paper is cream colored heavy stock so I can use markers and colored pencils and gel pens to add doodles and color code my thoughts and work. AND – I love that there is a section to record what I delegate and who I assigned it to…and the due date. So often those little details get all mixed up in the rush of my week. Thanks for this post! So fun! Wow- thank you Michelle! I’ve been toggling between all of these planners, watching the videos (I did get the fun Leonie Dawson workbooks, that much was clear) but for the day-to-day, I was feeling pretty stymied. I just checked into Action Day and took the plunge! I like your suggestion to play it up with colors, pens, and stickers etc. Thank you Nathalie for the list of great planners. I am using ROCK 2016 Business & Life Weekly Planner by Megan Petersen and Your Best Year 2016 by Lisa Jacobs this year. 2015 I used Your Best Year and loved it but wanted to add ROCK 2016 for the great worksheets and pages. 2014 I used Leonie Dawson’s Shining Year but there were too many pages that I did not use. I’ve been obsessed with finding the perfect planner, one that has a bullet journal style with the ability to plan ahead time based events. I found it with the Passion Planner which I’ve been using for almost a year. For 2016, I wanted it to function differently. I don’t like anything hard cover and wanted a wrap around cover to save space. So I got the download version, created some customized some folders and inserts, created a custom cover, took the whole thing to Staples for printing and coil binding and it’s beautiful. Oh, I absolutely love this review <3 Lots of really great stuff. I just have to introduce you to my pretty rebellious planner for entrepreneurs & professionals. It's a new thing called Rebel’s Agenda (www.rebelsagenda.com). You should totally check it out :) It helps to get biz stuff done & is already becoming super popular around the world. Yay! Thanks so much for this list. I have been searching for calendars and planners all year and nothing seems to work. I’m checking out your top recommendation Leonie Dawson. I instantly felt a connection with her hippie, artistic style when I saw her website. I too love paper planning and have tried to d planning via web or on my iPad with a stylus and I just don’t enjoy it. I’m hoping this will fit my needs. I’ve been struggling to find the perfect planner for YEARS, so I decided to make my own for 2016. I’ve made myself a little folder that I can add mini books to (one for each month) – this way, I’m not weighed down by a ton of useless stuff by the time we get to April. I’m pretty excited to start writing it! Hi there! I love this list, it’s just what I needed to start thinking about my 2016 goals. I read through all of the choices, and now I can’t remember which one I liked best….can you tell me which one has the retreat planning section? Fantastic list! Emily Ley’s planner was gold for me in 2015, and the Daily Greatness is on my desk and ready for me to scribble all over it next year. Fo me there’s an aesthetic piece to it, too. No matter how functional the set-up inside, for example, the aesthetic of the Leonie Dawson planner is just not my thing – and I have to like how it looks when I open a new page spread. I feel the same about the ones that have the same look as a planner I might but at Costco. I am drawn to the more elegant planners -I already know I love the Desire Map planner for this reason and I am curious about the Whitney English one. I also use a blank unlined notebook for lots of my bigger planning and ideas. This is my favorite organizer. I love this list. I always go back to the moleskine planner because I just love the soft leather feel of it, but I might have to try one of these this year. Plus I’m an astrologer so I created my own astrologically business planner to navigate the stars so to speak! It’s actually on of my achievements this year. I am also such a planner/organizer addict! I am leaning more towards the Top Down Planner, has anyone else tried that one? I can’t say that I love the outsides of any of them, but the planner part seems perfect for how I set up my day. Maybe I will get crafty and collage the outside with things that inspire me. I’ve tried the Passion Planner and the Life and Biz Workbook from Leonie,but they were both missing something that I wanted. I needed something that would help me plan for profit, and so the Strategic Biz Plan – Productivity and Profit Planner was birth. It’s on my site. And that’s what I’m currently using. I use Leonie’s and the Passion Planner! So glad they were on your list! Great article – and you have some of my favorites within, though I’m going paperless in almost all but noodling and journaling. Scheduled activities are in ical, synced to all devices of course – even my appointments with clients book online. Lists and reference resources are in Evernote. My daily To Do’s are organized through an online platform called Wrike, because it connects my lists and work with others who are depending on me, and vice versa. Then from this master spot, I copy 3 – 5 things I will do for the day onto a small piece of paper that fits into a lovely picture frame. It feels MUCH less daunting than the many activities swirling about me. No way I could accomplish all I want without these tools. Before these e-tools came along, I was a life-long Franklin Planner person, starting in college! I love not having to copy over To Do’s that didn’t get done; they roll forward automatically, and even pester me to ketchup very politely. A few years ago I bought Leonie Dawson’s Life and Biz Planners when they were pdfs. I think they’re fine but for some reason it didn’t click with me. I’m also a notebook junkie and have stacks of them. The problem with my journal is that I lose stuff in there. My journal’s main purpose is stream of conscious writing and my lists get run over when the creative flow takes over. Is there a way to cast a vote on these. I’d love to know what the consensus is. I’m debating between Danielle’s, Emily’s and the Day Designer. Thoughts? Thanks for reviewing so many different styles, Nathalie! I’m a recent Passion Planner devote – I L.O.V.E. my desk size passion planner so much I ordered the smaller one for toting around in my bag. My desk planner is for my website, life and school tasks. I like having it open on my desk as a way to keep track of things. I use the To-Do books to separate school tasks by course so that I can easily stay on top of it all. The smaller Passion Planner for my bag is for managing appointments and tracking health items. The black cover will keep it looking nice and I’m a big bag of the built in band to keep it closed. I also invested the the Epic Blog one-year editorial planner for 2016. That one feels more intimidating because I’m very much needing to develop more long term planning in this area. Hopefully it’ll be a good fit for my needs. Thanks also for reminding me about Leonie Dawson’s planner. I haven’t used it in a couple of years and am now thinking the exercises included would be helpful as I navigate a few important transitions. What iPhone app do you use for Google calendar? I’ve been using an Erin Condren Life Planner, but just switched to a Spark Planner. I need the goal-setting/tracking and weekly to-do sections. It’s very simple and isn’t fancy like my ECLP was, but I need function over fashion (for the first time in my life) to run my business! The Spark Planner was a Kickstarter and can be found at SparkNotebook.com. Top Down Planner!!!! Wrote a blog post on it as well. Perfect balance of creative and design with practical and business. I love love love it! If you haven’t checked out the Top Down Planner by Rebecca Rescate, it is amazing. She has both a dated and undated version and lots of resources and tips to help any entrepreneur. Thanks for the great list and review. After using Franklin Covey for years, I started to research what would really work for me. I first delved into the world of planners with the Planner Pad after much research. Yes, it’s plain. (There is a floral version but only at the cost of reduced writing space which didn’t cut it for me.) It really did function exactly the way I wanted it to. The funnel-down method is exactly what I need – I’m a list maker and my lists are mental and all over my life in buildings and rooms, on paper and boards and computers… I needed a place to put all the random things from my life into one space. I used that successfully for a year and because I’m a creature of change, I wanted to try another method, just to see. Plus, shipping the planner pad to Canada isn’t cheap. I was very interested in trying the Uncalendar – a super-unconventional method but a list-maker’s dream. Also struggled with getting that shipped here for less than a fortune, so I bailed. I am still interested in trying it… maybe someday. It’s darned ugly, though! So in my search for a similar-but-cheaper PlannerPad, I found something called the Personal Planner, which is neat because to some degree, the customer is able to personalize the planner. Not just the pictures and colours, either. I mean choosing segments and “boxes” to fill the page, whether it be bulleted lists, menu boxes, grocery lists, to do lists, lined vs. unlined boxes, a daily schedule, etc. I enjoyed this planner, but I did have to construct my own space for vertical “brain dump” lists and I found that annoying for some reason. (Lazy?) I want my list space build in, I guess. Moving on: I still wanted the funnel-down method (or that elusive Uncalendar) so I searched youtube and planning websites and blogs for something new but the same. I found something called the iBloom personal and business planner. It’s beautiful and expensive. It’s faith-based. It’s basically the planner pad but pretty with inspiring verses and such. It’s got room for me to dump all the things in my brain each week from my mental compartments of career, family, home, small-business, community, and self-care. So that’s what I’m using right now. I am not married to paying exorbitant amounts of money for a planner, so if anyone knows of any funnel-down planners please share! Someone mentioned that they were worried about not using the “middle” section of the Planner Pad (iBloom same thing). I think this Savor the Success planner mentioned above would be similar to the Planner Pad minus the middle section. But I do love that the Planner Pad format gives me 7 different little brain dump lists for the different roles in my life instead of one giant brain dump list. Thanks for sharing Hannah! Megan is a client from back in the day, and I didn’t know she released this planner. Looks great for all the mama CEOs! I am a “paper products and plannerholic” and I IMMEDIATELY took a liking to this link as soon as I saw it on Facebook. The very one I wanted was $60 and out of stock! As an entrepreneur I like to start early Planning for the upcoming year and even though I Love my iPad that I use regularly, I also like paper planners and colored pens for goal setting and ideas. I have found the ARC Customizable System (www.staples.com) from Staples very useful because they have daily and monthly calendars, project sheets, post it notes, to do lists, colored dividers, clear pockets and regular notebook paper that you can easily remove or add. I even created my own vision sheet on the front to keep me inspired on a daily basis. Thank you so much for your amazing list! My proudest 2016 moment? Launching and designing The Content Planner :) It includes 17 monthly spreads, social media stickers, daily planning, monthly/weekly goal setting, important marketing dates/holidays, places to list your hashtags and collabs — it’s perfect for me as a #BossBabe who runs her social media. The planner would’ve been perfect to add alongside this list! Maybe next time. Thanks for sharing your planner Kat – it’s awesome that specifically for planning content and social media, too! Just realized how boring my planner is. I get a default basic one from Staples and rework it to fit me. I think I am doing this wrong. Awesome list, but you left out my FAVORITE! It’s the iBloom Life & Business Planner! It’s fabulous for organizing your life and business- all in one place. Plus, there is even a “My Plan” tab at the beginning that helps you map our your personal (and business) priorities, goals, action plans, etc. It’s AMAZING!! I’m a planner addict too, so I made one! Mine is based on my work in astrology. It is for people who love to work with their own personal timing. It is a book AND a planner. There is information on astrology, crystals, essential oils, art journaling/journaling, gratitude, and oracle/tarot layouts for each month. I would love to send you one! This is a great post – definitely will be sharing! I’m giving Daniel LaPorte’s planner a try this year combined with May Designs slimmer bullet journal formats. This will be the first time in 3 years that Leonie’s planner won’t be in my stack of books.Although I love the processes and approach, despite the fact that Leonie is an introvert, I find it very “loud”. For the deeper work, I’ll be engaging with Louise Gale’s “Small Dreams Big Wonders” class and Janet Conner’s “The Lotus and the Lily”. As for accomplishments this year, I got my biz, Sleepytime Club up and running! 2017 is the year to get the word out. I adore planners and paper ! I have done Leonie’s a few years in a row but they got a little overwhelming for me and I never looked at them after the initial goal setting so this year (though I have done her process online) I’ve ordered the Lara Casey power sheets . I really like how it’s goal setting but forces you to reevaluate every month and break it down as you go. For daily planning I am into iCal and Asana but use the free downloads from Whitney Englis’s day designer of the blank day (dated doesn’t work for me- I skip days and rewrite Days) that I printed and bound as my daily planner. Every day it allows me to sit and map out my day – from appointments to tasks. I too am a paper-a-holic, I love paper planner and any fancy notebook, note pad, paper….love these that are listed!!! I love your descriptions Natalie! I’m sure these help even more now that you are a super busy mama! I did the last option (create your own) and it has been transformational for me and the women who use the planner I created. The Life Design Planner includes reflection of the past year and envisioning of the next 1, 3, and 5 years. Then we have review/goal-setting sections for every week, month, and quarter. I love and love and love using paper planners. And I cannot resist a lovely notebook either! Lol. I have used Erin Condren for the best part of 2016 but got bored with it in October and I decided to try Passion Planner that was introduced to me by my Writer Coach. I am loving it already! It is more detailed and I especially love the look and jotting down what you want achieved in 3 months, a year. 3 years and a lifetime. It gives you an overview of your goals for life. I am still testing with the free version to know if it would flow with my kind of person. So far so good, It’s been wonderful. I used it for November and I started Dec’16 on it today. looking forward to writing in it. In order not to get bulky, I printed out the monthly ones and designed my front and back cover to look more appealing. I loved A5 size notebooks/journal but I am experimenting with A4 for this December planner. I enjoyed going through your article. Thank you for it. I’m a paper products junkie, too! A lot of my Instagram feed revolves around planners, planning, organizing, etc. As much as I love a good planner, over the years I’ve spent a ton of money on notebooks, day planners, and other gear that I ended up abandoning without finding any success. I was almost at the end of my rope when I found the Bullet Journal system. It changed my life. It’s so versatile, I can’t help but use it, and I enjoy being able to change my format from day to day or month to month. And it gives me a chance to use all those blank notebooks I’ve accumulated over the years! Awesome! I like the journaling aspect of so many of the planners. I bought 4 different ones on the list! This is fantastic, I can’t get away from paper planners either! I use the Self Management Planner. It has everything I need and nothing I don’t. And it uses SMART goals to track progress toward goals each day. Plus the planner is self-dated, so for people like me to start their planner in the middle of the year, we don’t lose 6 months of planner pages. – This year I left my job and have ventured out to start my own company. So my planner has become my life :) Next year I am using my planner to help me train for my first ultra marathon! I will am a planneraholic! Hubby was always bugging me about how many planners I owned until I found the perfect one for me…the passion planner. I have used it two years in a row and just ordered it for 2017 which is a major feat for me sticking with one for so long. This is a great collection! And I love how thorough your review is. I also completely agree with you that, it isn’t always about the planner specifically, it is about finding something you will use everyday that helps you get stuff done! That being said, my business partner and I weren’t able to find that perfect layout, always felt like we were sacrificing something. So we decided to get in the market and design our own. Check it out for yourself: http://www.upstudionc.com/. I’m sure you’re picky, just like us, when it comes to the layout, won’t be a perfect fit for everyone. If you’d like to try it out though, shoot us an e-mail and we’ll send you one. Again, love that you aren’t bias, just encouraging everyone to find their system! Love it! A friend of mine is a BusinessCoach and recommended ibloom to me. Has anyone used this? Thank you for your list. I’m going to try the Passion Planner. It looks like it fits EXACTLY what I was looking for, and at the right price… icing on the cake! So I’ve worked through your suggestions and got the Daily Greatness planner for business. It costs a bit more to ship to Canada but I think it will have everything in one place for me to plan and run my business. ps. I already have Leonie Dawson’s big/dream planner. Love those and have been using the life and biz ones for a few year! Well this hasn’t helped me at all. I’ve been staring at the Rituals for Living Dreambook for the past month or two, I purchased the Passion Planner last year. And now you’ve shown me SO MANY OTHER OPTIONS. I’m just overloaded. I think what I need is something that’s not a dated planner. I buy so many planners and calendars and never use them beyond March. I also have a billion blank books. I’m so torn now. I’m trying to decide between Rituals for Living Dreambook (now that the planner is incorporated) and the Passion Planner. I would love to hear the major differences, pros and cons.